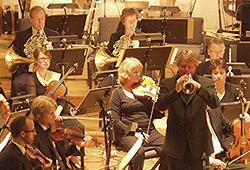 Ole Edvard Antonsen performs the Haydn Trumpet Concerto with cadenzas by Penderecki. In 2002 the Polish composer Krysztof Penderecki composed new Haydn Cadenzas dedicated recording trumpet soloist Ole Edvard Antonsen from Norway. They were premiered with the Stuttgart Philharmonic under Pendereckis baton, and soon also performed with the Berlin Radio Orchestra. 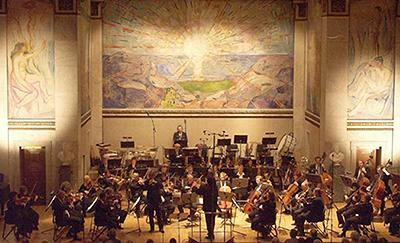 Antonsens performance on October 4th in Oslo was accompanied by KORK, The Norwegian Radio Orchestra, directed by Nicolae Moldoveanu (former student of Antal Dorati). The event took place in the old assembly hall of the University of Oslo, cherished for its breathtaking acoustic properties and expressive wall paintings created by Edvard Munch in the years 1909-16. Ole Edvard Antonsen was the first brass graduate from the Norwegian State Academy to be awarded the highest distinction in his Diploma. He has through the last 15 years established himself as a world class trumpeter touring the American, European and Asian continents giving 100 concerts pr year. He started out by winning 1st prize in the CIEM competition in Geneva 1987. It was the first time ever that a trumpeter had won that competition with a unanimous jury, and it was also the first top prize designated a trumpeter since Maurice Andre in 1955. Ole Edvard Antonsen, not thinking much of competitions within the music genre, states that ...most performances have something positive about them. I find it very important that this positive core is encouraged; it's so terribly easy to criticize. One should instead ask what a musician wants to say with his interpretation, and why he plays like he does." Ole Edvard Antonsen also claimed 1st prize in UNESCOs competition in Bratislava in 1989, before he entered the recording studios. His rock-inspired legacy Tour de Force sold over 140,000 copies in Norway (4 million people), and made Ole Edvard Antonsen responsible for an eruptive interest among boys and girls to start playing this instrument. This CD is finally up for a new release in January 2004. Ole Edvard Antonsen has a special passion for contemporary music and has premiered more than 40 works dedicated him. But for some time he has also been busy making the third movement of Haydns concerto increasingly popular among the younger generations of Europe. He therefore moves carefully between satisfying discriminative and mature audiences with his elegant and exquisite renditions of classical and contemporary music, to exhilarating and thrilling audiences of 20.000 pop enthusiasts with the same music. It is both what he does and the ways he does it that has established Ole Edvard Antonsen as one of our countrys most cherished and versatile artists. Ole Edvard Antonsen will be performing the Haydn Trumpet Concerto with Penderecki's Cadenzas in Tokyo in Week 46.